The Nigerian government says it “will not relent” in its efforts to free the last remaining schoolgirl being held by Boko Haram after a kidnapping in the town of Dapchi last month. The girl was among 110 girls taken from their school when militants stormed the town on 19 February. Most were released on Wednesday but one girl, a Christian who refused to convert to Islam, is still being held. The president said the girl will not be abandoned. “President Muhammadu Buhari is… committed to the freedom of the only Dapchi schoolgirl still in captivity,” a statement said. Of those seized, 104 girls were released on Wednesday and five reportedly died during their captivity. Two other people – a boy and another girl from Dapchi – were freed at the same time, the government says. The government denies claims that Boko Haram was paid a ransom for the girls’ freedom, or that there was a prisoner swap. Information Minister Lai Mohammad told the BBC’s Focus on Africa that the girls’ return was part of ongoing talks about an amnesty in return for a ceasefire. “We did not pay any ransom for the girls. We discussed with them the cessation of hostilities in return for possible amnesty,” he said. “If they [Boko Haram] returned and lay down their arms and renounce their membership of the insurgency, then we will give them free passage and they can return to society,” Mr Mohammad said. He added that the government was “taken aback” by the abduction because it was a breach of the talks. 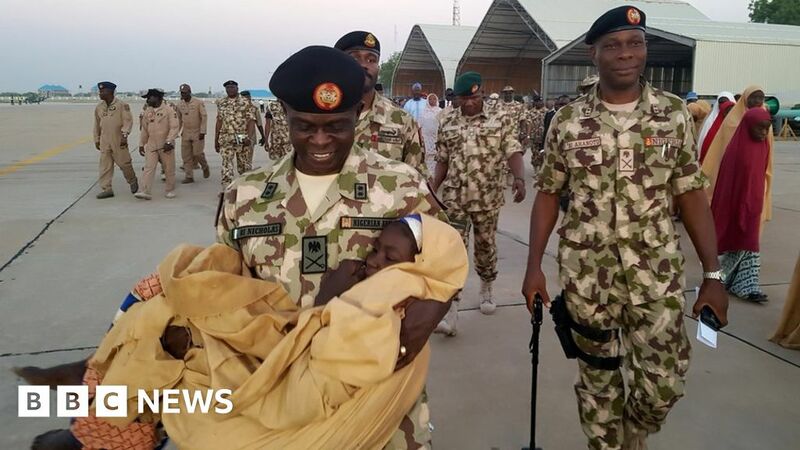 Meanwhile, the father of one of the kidnapped girls has described the pain of losing his daughter again after she was flown to meet the president shortly after her release. He told the BBC he had only been able to see his daughter at hospital for a few minutes. “Even though I assured her I wouldn’t leave her there, we were all asked to leave and they took them away,” he said. The freed girls are expected to undergo some medical screening and debriefing before meeting President Buhari, possibly on Friday. His administration has been under pressure to resolve the abduction, which revived painful memories of the 2014 kidnapping of 276 girls from the town of Chibok. Former Nigerian President Goodluck Jonathan was criticised for his handling of the abductions in Chibok, some 275km (170 miles) south-east of Dapchi. The freed Chibok girls were also immediately taken to meet then-President Jonathan after their release. However, more than 100 girls from Chibok remain missing. Amnesty International criticised the Nigerian military’s handling of the Dapchi kidnapping, saying it had ignored repeated warnings about the movement of Boko Haram fighters prior to the abduction. Amnesty’s Nigeria director Osai Ojigho called the kidnapping a “catalyst for the government to ensure adequate protection of all schools in the north-east so that this can never happen again”. The military said Amnesty’s allegation was an “outright falsehood,” AFP reports.